Since 1980, this one thing has predicted every recession, and nearly every stock market bust. Nothing comes close to this indicator's accuracy. The crazy part is, this is a man-made problem... And it is entirely the Federal Reserve's fault. Whenever the Fed artificially raises short-term interest rates ABOVE long-term interest rates, bad things happen. For some reason, the Federal Reserve likes to upset this "natural order" about once a decade... It forces short-term interest rates above long-term interest rates. When this situation happens, we have what's called an "inverted yield curve." History shows this is a bad thing. As I've written before, the inverted yield curve has caused every market peak over the past 40 years. Last year, short-term interest rates were less than 1%. Now the Fed says it expects to raise short-term interest rates to 3.125% by the end of 2019. A 3% interest rate is outrageous in today's world – especially when you realize that short-term interest rates are 0% in Germany and 0.1% in Japan. Zero-percent interest rates cause their own problems. However, in this environment, the U.S. simply doesn't need short-term rates that high. Even worse, long-term interest rates in the U.S. today are about 2.9%. If they stay unchanged, then the Fed will – once again – cause a recession and a stock market bust. At least one member of the Federal Reserve gets it... And he's speaking up. I'm talking about James Bullard, president of the Federal Reserve Bank of St. Louis. "Given tame U.S. inflation expectations, it is unnecessary to push monetary policy normalization to such an extent that the yield curve inverts," Bullard said in a speech in Kentucky on Friday. He is worried about what I'm worried about: "There is a material risk of yield curve inversion... if the [Federal Open Market Committee] continues on its present course." So what can be done to prevent an inverted yield curve? "The simplest way to avoid yield curve inversion in the near term is for policymakers [at the Fed] to be cautious in raising the policy rate," he says. All right! Bullard is at least one voice of reason at the Fed. Will the Fed be hardheaded and once again force the economy into recession and a stock market bust? Bullard is trying to avoid that outcome: "We are, and have been, having a robust debate... on this issue," he says. Unfortunately, Bullard is not currently a voting member of the committee that sets short-term interest rates. The biggest cause of recessions and stock market busts since 1980 has been the Federal Reserve. When it aggressively hikes short-term rates above long-term rates, bad things typically happen in the economy. Let's hope Bullard can talk some sense into his colleagues – to avoid an entirely man-made recession. "If the Fed keeps raising interest rates as it has promised to do, this indicator will turn negative again," Steve writes. But how long would it take for recession to strike? Learn what history tells us right here: Exactly When the Stock Market Will Peak, Revisited. Mike DiBiase recently revealed how the Fed's manipulations could bring America's corporate-debt crisis to a fever pitch... Read more here: The Next Crisis Will Be Much Worse Than the Last. 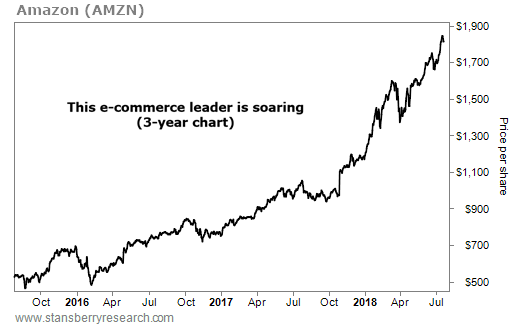 Once e-commerce giant Amazon (AMZN) took the lead in online retail, it never looked back. The company began as an online bookseller, but it now offers a wide variety of goods – clothing, kitchen items, electronics, and more. This wide reach helped push Amazon ahead of the pack… Last year, Amazon sales accounted for 44% of all e-commerce sales in the U.S. – about $178 billion in e-commerce revenues. It amounted to almost 4% of total U.S. retail sales for the year.